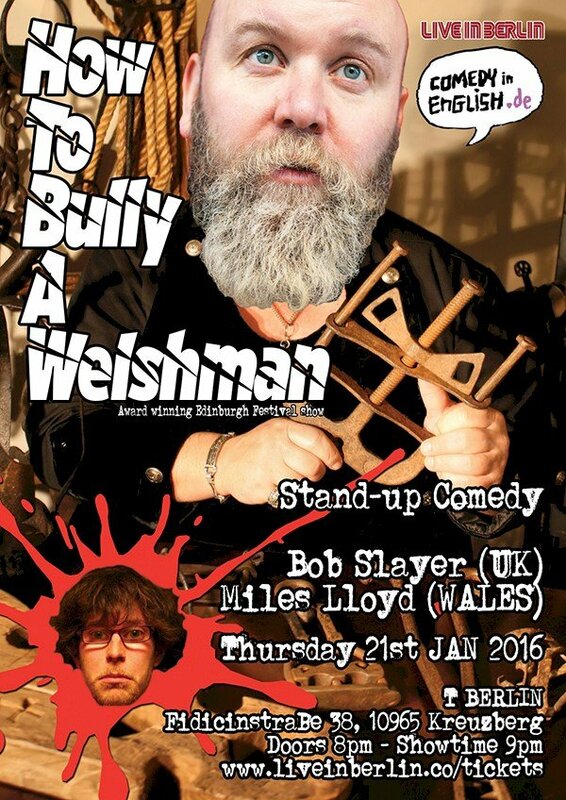 This event "Bob Slayer (UK) Comedian : How To Bully A Welshman" @ Tea Tea has already ended on 01/21/2016. In 2009 I quite literally found Miles Lloyd (Welshman).. It was 5am and he was climbing into a skip to go to sleep. He had gone up to Edinburgh Fringe with £20 and an out of tune guitar to make his fortune, however things were not working out so well and he was forced to sleep rough. I invited him to come on my show. And I bullied him. A lot! The result was a Malcolm Hardee Award. 5 years later and it is time to reprise this show - reworked for the 21st century! The show now contains all the behind the scenes stories of the trials and tribulations of trying to do Edinburgh Fringe with the most haphazard, incompetent but beautiful man in Wales! Show starts at 9pm sharp (but the sharpness ends there!). - Doesn't have a website - He's only just got his own shoes!